When you visit the beautiful beaches of St. Johns County, remember beach safety is everyone's concern. Marine Rescue personnel provide lifeguard coverage along several miles of coastline from Memorial Day Weekend to Labor Day Weekend from the hours of 10:00am until 6:00pm weather permitting. The National Weather Service reports that Rip Currents are the most deadly weather related event in Florida claiming over 25 lives each year. In a typical year rip currents are more deadly than hurricanes, lightning, and tornadoes combined. You can easily spot a rip current by its foamy, choppy surface. 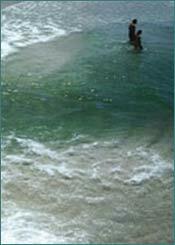 Water in a rip current can be dirty brown from the sand being turned up, and moves rapidly out to sea. A wide spectrum sunscreen with a Sun Protection Factor (SPF) of at least 15 blocks most of the harmful UV radiation from sun exposure. Marine Rescue lifeguards are stationed along various stretches of the shoreline for your protection. You can help them make your stay a safe and enjoyable one by checking with them on local conditions and by swimming with a buddy in front of a staffed lifeguard tower. The intertidal zone is home to a variety of sea creatures that have been known to injure the occasional unsuspecting beachgoer. Marine animals such as jelly fish, stingrays, sea urchins, saltwater catfish, algae blooms, barnacles, and of course sharks are among the most feared, despite the relatively low number of injuries. Heeding the advice of lifeguards and other public safety officials will minimize your chances of encountering one of these creatures. * The brochure and sign on this page are the product of a partnership between the National Oceanic and Atmospheric Administration (NOAA) and the United States Lifesaving Association (USLA). These materials represent a dedicated effort to raise awareness of rip currents and to standardize the educational message. These materials may be reprinted in their entirety, at no cost to NOAA or USLA and without permission. Other than appending recognition of the organization funding the printing of the materials in the white space above the NOAA and USLA logos (such as adding an organization’s logo), editing and changes to these materials (brochure, sign) contents is not granted. This NOAA-USLA message has been extensively vetted by their team of meteorologists, coastal scientists, and lifeguards, in conjunction with communications specialists.